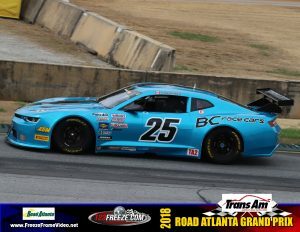 Despite some earlier forecasts, Round 2 of the SCCA Trans-Am series ran all weekend under nearly ideal weather conditions at Road Atlanta, GA. BC Race Cars entered two TA2 cars, the #25 house Camaro driven by Misha Goikhberg and the #48 Camaro of Mike McGahern. Mike struggled a bit, both with set-up and coming to terms with the daunting turn 12 at this super-fast race track. He managed a respectable 20th in qualifying and was looking forward to a good race. He passed some cars early on and worked his way up to 17th, having some great battles that lasted many laps. A slight touch of a curb on lap 19 launched the car and destroyed the nose as it landed off-track, ending an otherwise solid day for Mike. Misha, a newcomer to sedan racing, adapted quickly to driving a heavy car, a vastly different technique than the prototypes he is used to piloting. Helping along was his driver coach, Bob Perona (who incidentally also coaches James Hinchcliffe) who proved of to be invaluable in both coaching Misha and helping to make set-up changes to the car. By the time qualifying came around, we had a great car and Misha pulled a wonderful lap, qualifying 3rd, only 0.042 seconds behind second place. The race proved to be most exciting, the top 5-6 cars fighting a fierce battle close together. Misha dropped back twice to 5th, but managed to make it back and was running in 3rd for a good portion of the race. He complained on the radio that his tires were giving out, but so was everybody’s as Misha set fastest lap of the race! On the last lap, he was in 4th and the 5th place car made a last moment desperate move in the turn 10 braking zone, punting Misha off the track and into the gravel. 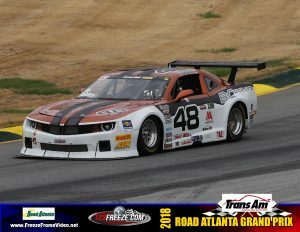 Trans-Am penalized the driver, but of course could not give back our 4th place. Overall a great and exciting weekend. 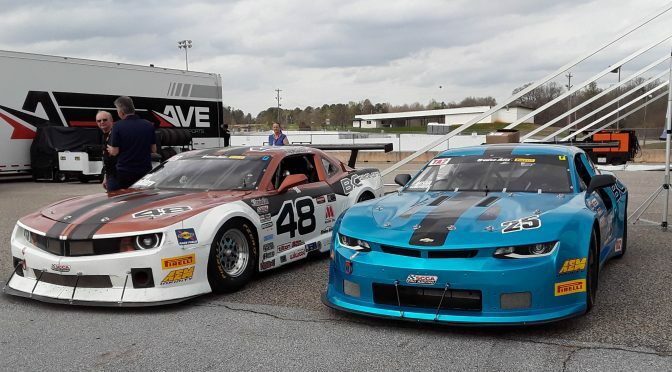 Misha is an amazing driver to have accomplished what he did the first time in the car and hope he will be back to pilot our #25 Camaro.